The spice cabinet used to be one the most frustrating areas of my kitchen. It was full of bottles of every size, and a million snack bags of even more spices. If your spice cabinet is equally unorganized, then you know how annoying that can become when its time to make a meal! Luckily all it took was a simple (and frugal!) 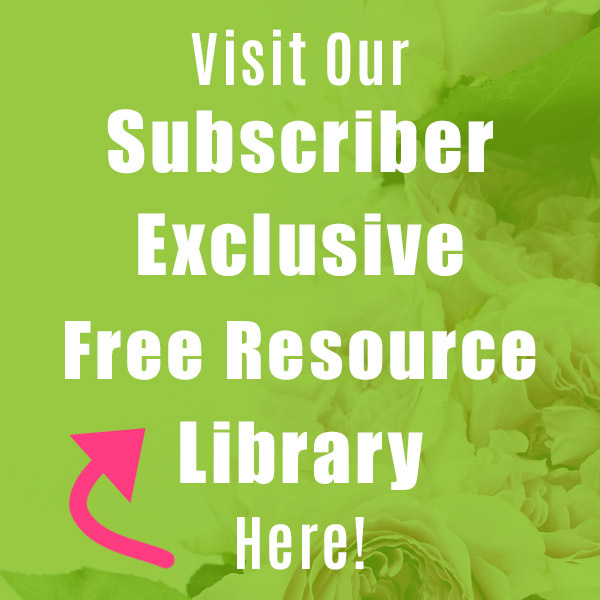 DIY project to make all that frustration disappear! Here’s how I made my handy DIY Magnetic Dollar Store Spice Rack! I love buying bags of spices, because they are always a fraction of the price of bottled spices. 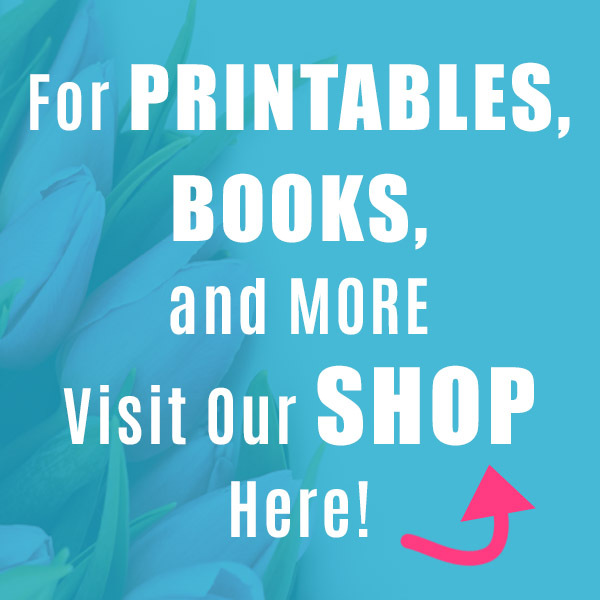 However, they are also the most difficult to store. I usually put each bag in a sandwich bag and then keep all the sandwich bags in a large freezer bag. Then when I need to make dinner I can never find the herb or spice I need! 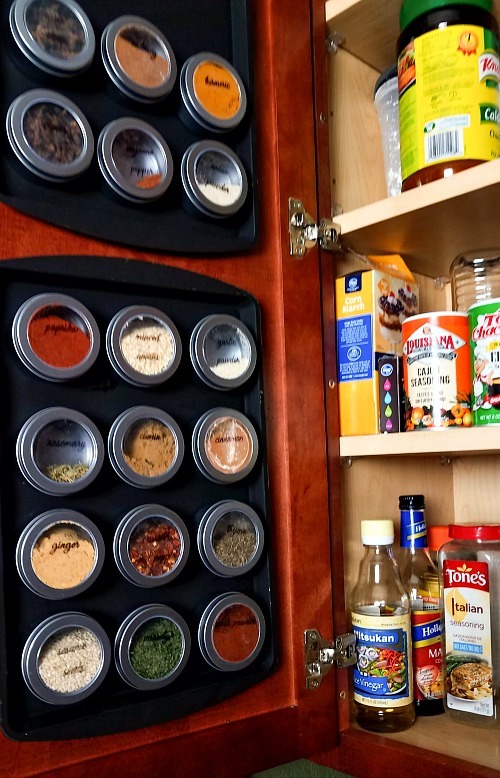 When I came across small magnetic containers with clear lids at the Dollar Tree I knew they were perfect for storing all the spices I shove in that freezer bag. I now have a new hanging spice rack inside my cabinet door, and it only cost $8! It took less than an hour to make and that was just because I had to wait for the paint to dry. 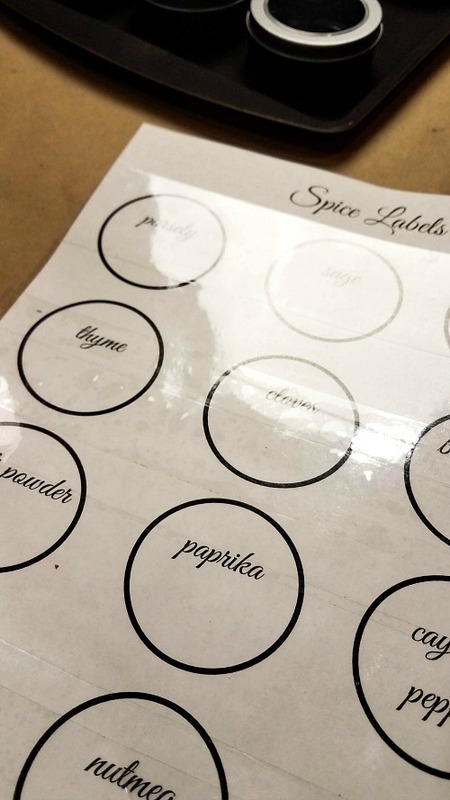 I also designed some printable spice jar labels to fit the containers from the dollar store (24 pre-written labels plus 12 blank). My DIY magnetic dollar store spice rack looks fantastic, and I am so excited to share the instructions with you! I chose to paint my spice rack using chalkboard spray paint, but any spray paint will do. I just happened to have chalkboard spray paint on hand, and thought it would be nice to write on it with chalk markers if I want. 1. Lay the cookie sheet outside on the tarp or old sheet. 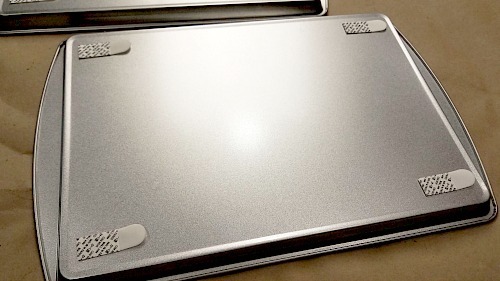 Paint the cookie sheet with spray paint and let it dry. 2. 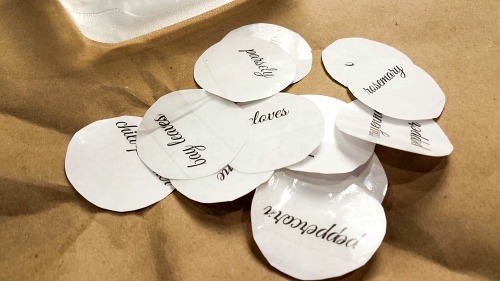 Print out your labels. Cover the front of each sheet with packing tape. 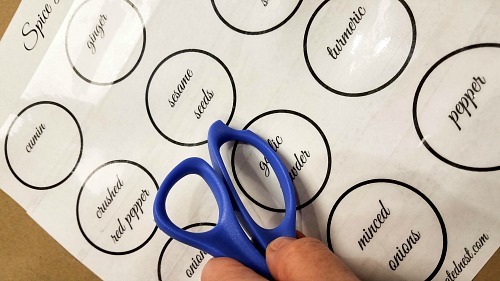 Using the back of the scissors rub the tape over the words. 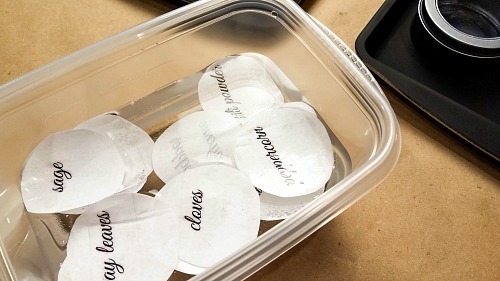 3.Cut out the labels and toss them in the bowl of water. Let them sit for a couple minutes. 4. Peel the paper away from the tape. The ink will remain on the tape. 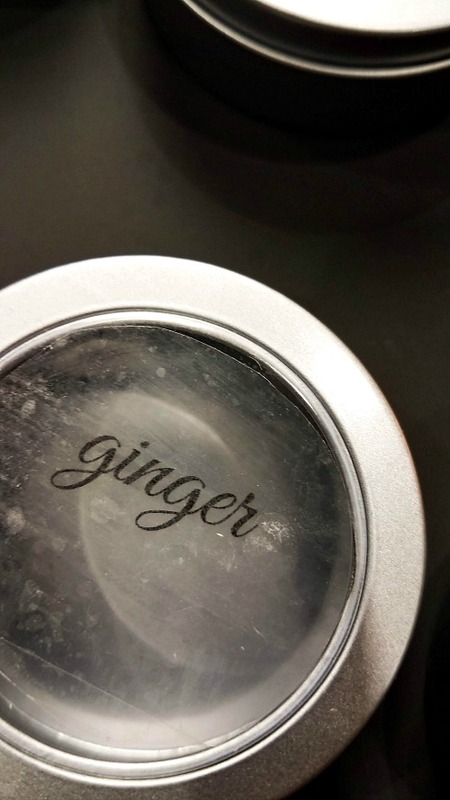 Place the labels on the lids. 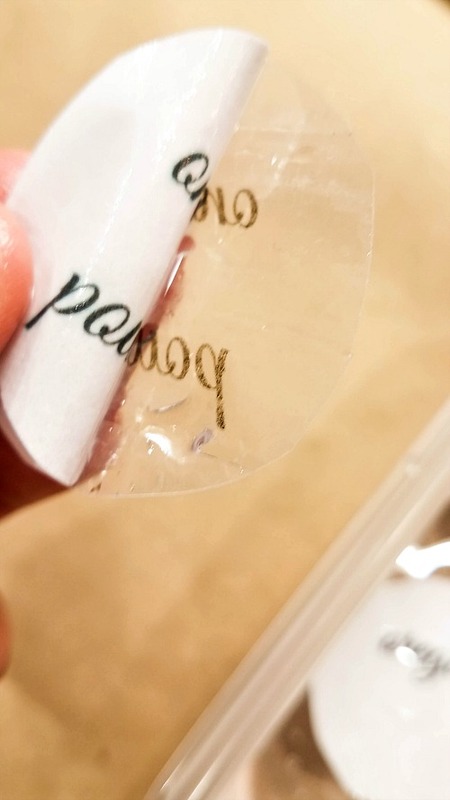 The glue on the back of the tape might look a little white, but that will disappear as the label dries. 5. 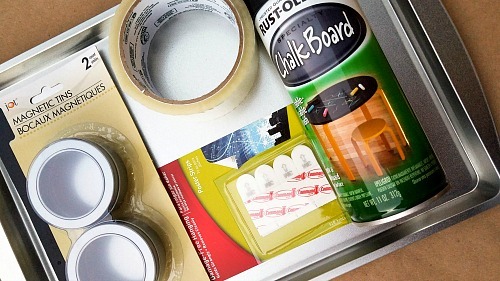 Apply the poster strips to the back of the cookie sheet, and then hang it inside your cabinet door. 6. 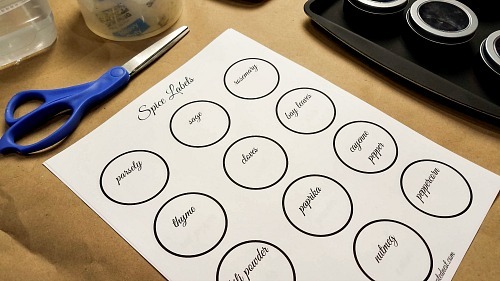 Fill your magnetic containers with spices and herbs, and hang them on the cookie sheet. 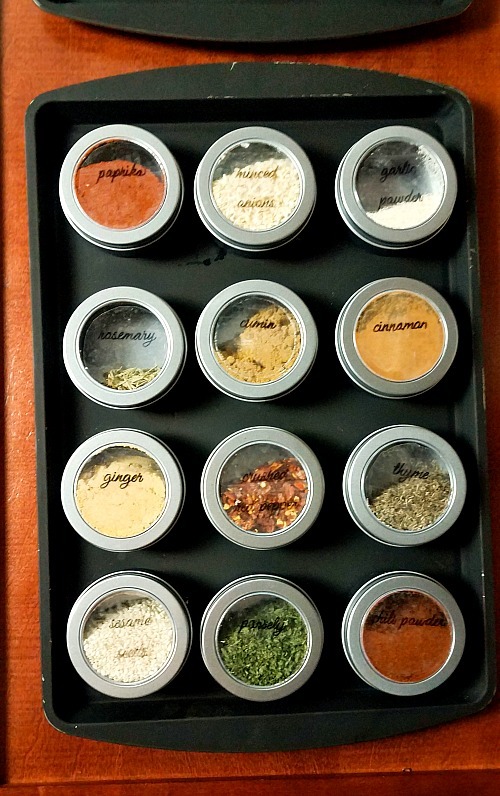 That’s it, your DIY dollar store spice rack is finished! Your spices are now organized, and easy to access. I wound up doing this process for two cookie sheets and 18 containers. That filled 1 and 1/2 cookie sheets with spices. Since I painted my cookie sheets with chalkboard spray paint, I figure I can write things in the empty half of the second cookie sheet. 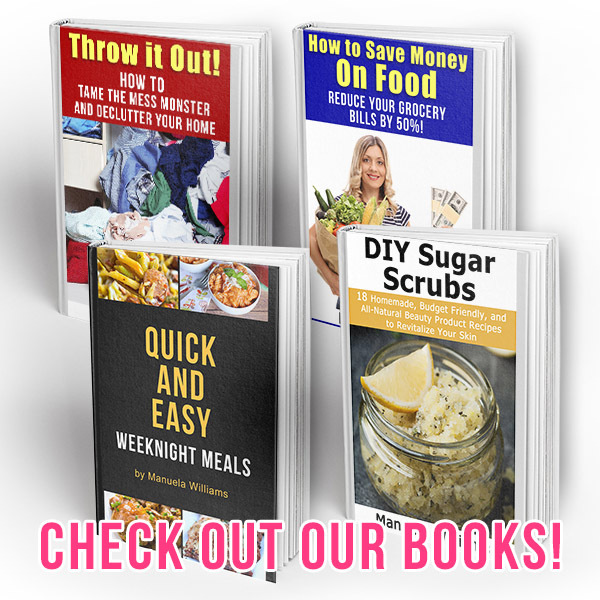 Maybe I’ll draw up a measurement conversion chart, or write down my weekly menu plan! Because of this organizer, I now have so much more space in my cabinet. I hope you enjoy your spice rack too! How organized is your spice cabinet? About Rachel: Rachel is a big believer in living life as your best self. She likes her coffee black and loves to curl up with a good book. At HyperHypoMama.com she writes about creating a healthy life with Thyroid Disease through food, yoga, and love. I also found these containers at Dollar Tree. I have paid much more for similar tins. My hesitation about using these for spices is that I doubt they are food-grade containers. Many of the products at Dollar Tree come from China and have significant amounts of lead. I have read that it is important to use only products specifically designed to contain food. Do you have any thoughts? 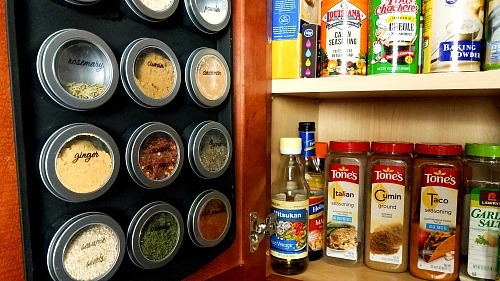 A great way to get more room out of your spice cabinet! Love the little labels too. 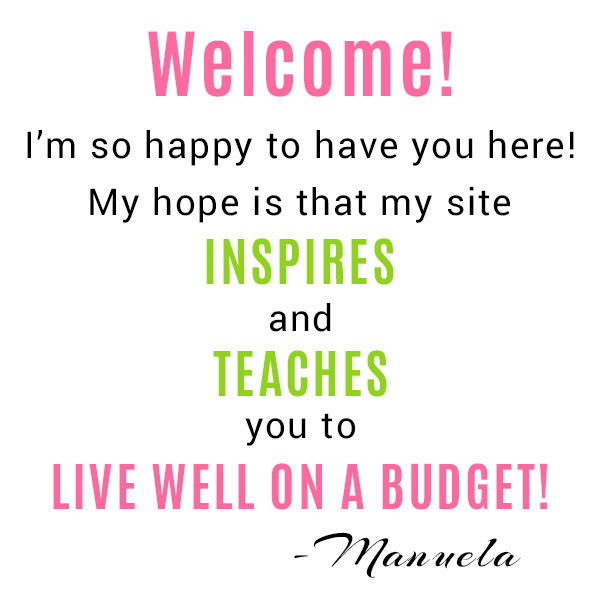 Thanks for sharing with Funtastic Friday!